UK: This thrill-seeking surfer was but a speck on this enormous wall of water as he appeared to set a new world record for the biggest wave ever ridden. Surfing legend Garrett McNamara caught the towering wave - believed to have measured around 100ft - off the coast of Nazare, in Portugal recently. If the claims are verified the U.S. born athlete will have successfully beaten his own record, which was also set at Nazare, when he successfully rode a 78ft high break at the end of 2011. Mr McNamara, 45, was born in Pittsfield, Massachusetts, but his family moved to Hawaii’s North Shore when he was 11 where he followed in his older brother Liam’s footsteps and began to surf. He started competing professionally at the age of 17 and spent ten years on the circuit with his brother. His previous record breaking ride in 2011, described as ‘inspiring’ by fellow pro-surfers, beat the previous record by one foot. 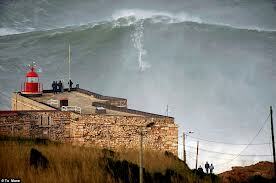 The surfer’s latest breathtaking feat came yesterday, as huge waves crashed off the coast of Nazare throughout the day. The exposed beach break in the north of the country attracts surfers all year round. McNamara risked being forced dozens of feet beneath the water, or slamming into a reef or the ocean floor, if he had wiped out on the massive wave. His 2011 record was confirmed by a panel of experts at the annual Billabong XXL Global Big Wave Awards.